I frequently find myself missing my mother-in-law. She passed away on my daughter’s 16th birthday, ten years ago. She was a great MIL–a warm and slightly eccentric and very talkative woman–who didn’t care if my house was clean ;). She went out of her way to be kind to others, especially children and animals. As a bonus, she was a talented painter. Although my MIL grew up in Canada, when she was very young, she left for New York City to study at the Art Students League of New York, where she adopted the professional name Diana Dale. While living in New York, her favorite subjects were of musical people (Broadway stars and jazz greats) and the people of her neighborhood, such as the Chinese man who ran the laundry she frequented. She hung out in Broadway theatres, painting actors like Katharine Cornell, Mary Martin, Ethel Merman, and Ezio Pinza. This image is the best I could manage because the glare from the glass was terrible. It’s Patricia Morison, the star of the original Broadway cast of Kiss Me, Kate. 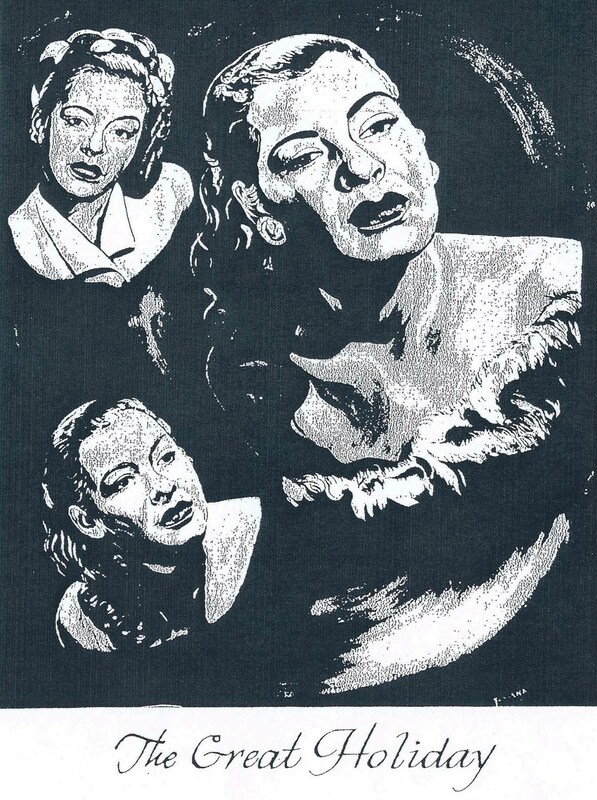 She also painted celebrities like Duke Ellington on the murals that graced the walls of the Birdland nightclub. I recently found a line written about her by the uber-famous Walter Winchell: “The Birdland walls are from the easel of Diana Dale, a part- time hatchick there.”Hatchick?! Well, I did know that she was a hatcheck girl and a cigarette girl in the Harlem clubs. Her murals created much of the visual ambiance of the Birdland. Here is a photograph I found online of members of Stan Kenton’s band and Count Basie‘s Orchestra. I hope it’s ok to use this photo; I’ve linked to the site it comes from. It was signed to Gabe Baltazar (4th from left). 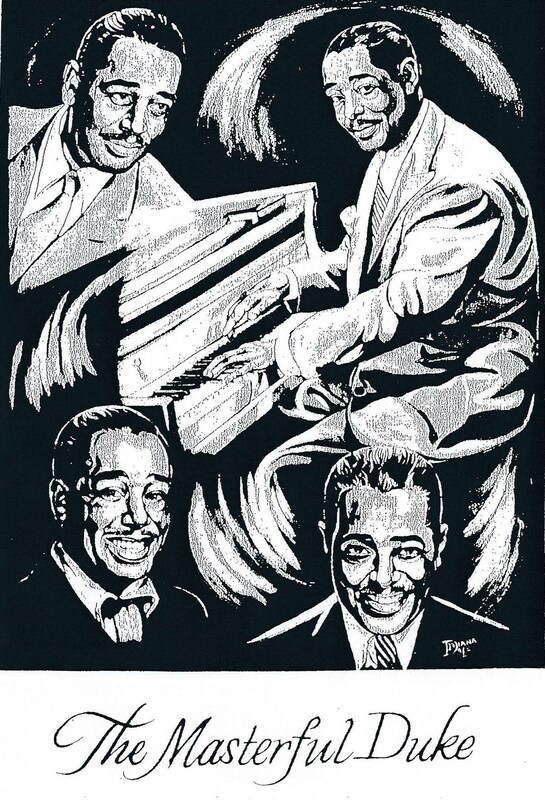 Notice that the Diana Dale painting on our left behind the men is one of Count Basie. The painting in the center is Dinah Washington. I’m not sure about the right; any ideas? Since the date associated with this photo is 1962, the murals must have stayed with the club until it was closed in 1965 (it has reopened since then). These murals that you have viewed on the preceeding [sic] pages hang on the walls of the Birdland as a permanent exhibit. We have printed them in this book in answer to the many requests of Birdland patrons who have asked for copies. They are recognized as the finest collection of contemporary drawings of jazz personalities extant. Jazz and art critics have hailed these works as the finest, therefore, it is with great pride that we have the exclusive privilege of presenting these wonderful copies in “The Birdland Story” to you, the coolest people in this gone world, our patrons and our fans. All these drawings were conceived, designed and executed by Diana Dale. Note: “gone” here is jazz slang and means fabulous. More to come on my MIL and her work. I am intrigued and look forward to learning more. Thanks, Maggie. She was such a wonderful MIL! What a fabulous story!! I wasn’t familiar with the Birdland story and your MIL Diana Dale but the murals were unbelievable – and of course, I recognized the musicians and Broadway’s Patricia Morrison so I truly appreciate the “look” of the period. Remarkable…remarkable…remarkable. Can’t wait to read the next segment – wonderful legacy!! Sheila, it’s so true that her paintings capture the look of the period, as you say. Although we have a lot of her “leftover” paintings, we put our favorites in frames and now we can’t photograph them because of the glass. OK, not we. I did it. So stupid. Stay tuned :). Thank you so much! I will write more about her in the future! What talent she had! Can’t wait to read more. Thanks, Kate. I will write more about her, I promise. Unless my cats get jealous of you writing about your cats and want me to write about them ;). Fascinating! I do know about Birdland, from music, but I never considered the artists who decked the walls. Sounds like she was a marvelous person to know and love. Thanks for sharing this. Ah, I love that you know about Birdland! A place that must have been more experience than geography! Imagine what it was like to be a really young woman working there and having them hire you to paint all those celebrities! Opportunity of a lifetime, to see all that, and to be part of it! Gotta love anyone who doesn’t care if your house is a mess. Hahaha, A. So true! And she didn’t care if hers was either! This is a lovely tribute to your MIL, Luanne. Wow! What a talented artist she was. I’m curious, does your husband have artistic abilities in this area? Thanks for sharing her work with us. I love her quote on hard work! He does not, although he is very good at making repairs that require creativity and skill with his hands. He’s also creative in business. But he is not an artist in any form. However, Diana’s father was a cantor whose tenor voice was so well thought of before he immigrated from Ukraine to Canada that he was asked to sing for the emperor. What a great story! I look forward to Part II! I feel a connection to your MIL because I am a jazz lover and I love her paintings! WJ, see my comment to Jill above. Did I ever tell you that about hubby’s grandfather? Oh my gosh, what a truly remarkable MIL – someone I would have enjoyed knowing. Her murals are simply astonishing for both their rich historic and lovely artistic value. Where are the murals today? Wouldn’t it be great if they could be reproduced for posters, notecards, bookmarks? Something to honor your MIL and the Birdland era and its noteworthy musicians? The richness of these snippets of American history are so valuable to our shared culture. 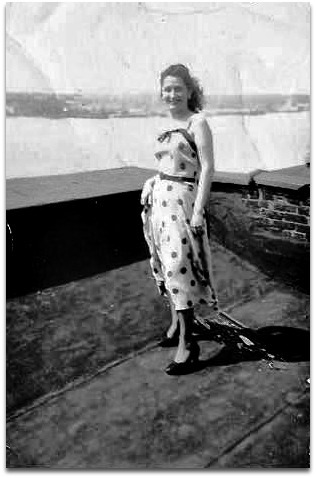 Thank you, Luanne and let’s hear more about Miss Dale – who she was as a mother, MIL, and artist of her era in NYC . Sammy, that would be so cool! Last thing we knew about a dozen of the murals were in the hands of a private collector, but I’m not sure where they are now. I wrote to a jazz curator at Rutgers to see if he knows anything, but I haven’t heard back yet. I also wanted to know if they have a copy of “The Birdland Story,” the book we own that Birdland used to give to patrons. That’s how I have copies of these paintings. We do have some paintings of other celebrities, though–a few Broadway and then Al Jolson, Milton Berle, etc. 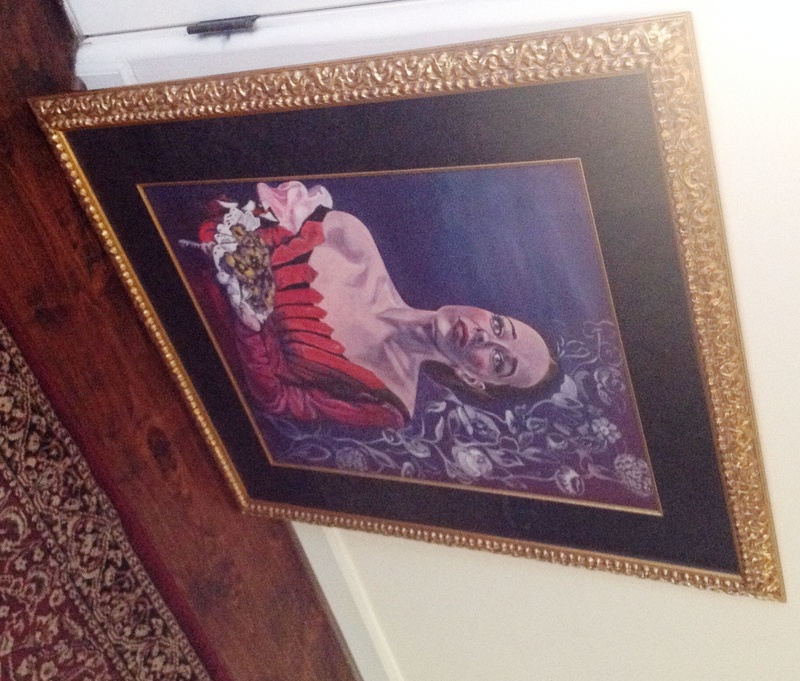 My SIL has a full length painting of Helen Hayes. It was a 2nd version painted by my MIL when Helen Hayes commissioned her to paint her. She was also hired by Frank Sinatra’s family. Luanne, it’s so great that you had a wonderful mother in law. I did too. And for her to have studied art at that school, very nice! Thanks for sharing her work! Hollis, I’m so happy that you had a wonderful MIL also! There is something so freeing about having such a good relationship with the mother of your husband. Great, the past , the Legacy. Thanks for sharing. Now, “we” are the older generation. Our project/goal: The young ones will not know their Grand Parents quality and challenges. We’re attempting to write the story. Thanksgiving after dinner story time was fantastic this year. That’s so wonderful that you have started that tradition in your family of passing on the family stories. It’s also good when there are children who want to know. I was that child. Most of the rest of the grandparents could have cared less. I’m trying to document stories for the younger generations now. She sounds like quite the lady. Very talented too. Thanks so much, Anneli. I think so :). And she was very sweet, too. Wonderful – thank you so much for sharing about your MIL. She sounds like quite the lady! Thanks, Audrey. She sure was! She was fun, too. Well I’ll be ding-danged! Imagine having your art hanging out with all those gone people in the jazz-world. How amazingly cool to be associated with such a legendary time and place. Can’t wait for part 2. You crack me up. Hah, yes, very cool! My husband loved growing up hearing all her stories. Wow, Luanne! What a nice tribute to an interesting and very wise woman. To be in NY during that time period and associated with the artsy side of the community…that’s just awe inspiring. A full-length book about her life in that world would be a fabulous read. Wouldn’t it have been fabulous though? I did video tape her telling some of her stories a couple years before she died, but I haven’t listened to it in a long time and probably don’t remember some of the details. And that was just a drop in the bucket, I’m sure. I also used to like to hear about the specific men who “chased” her. Thanks, Elyse! I’m glad you enjoyed reading about her! Awesome! I miss my MIL too. She died too young and unexpectedly. I only got to know her for about four years. Wish I’d had longer. I’m so sorry your MIL died so young. Your time with her was too short, and I’m sure the whole family must miss her a great deal. I think I’ll write a little about how she gave me love and care! She was such a treasure. So glad you enjoyed this! Marie, we had some wonderful times with her. And although I was lucky to have 30 years with her, she did die too early. She was 82, but in great health. Since she was getting more frail, we talked her into moving and since her dog had passed away, getting a cat instead of a dog. I bought her a Life Alert. Then she fell down the stairs before she moved. She broke her arm and went to visit my SIL. While there she went to the ER with an odd spell. They sent her home and in 24 hours she died. A stroke or a heart attack, probably related to the fall. Oh, I’m so sorry. I’m sure you often think of “what if” she just hadn’t had that fall. Love this post! I wish I had a relationship with my MIL as you had. You were truly blessed. So blessed, Tilly! There is something so calming and freeing to have a happy relationship with a MIL. If it wasn’t not like that I’m sure I would have been miserable. I loved learning about your MIL, Luanne. 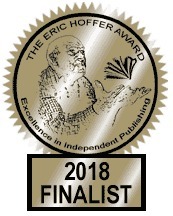 What a lovely testament to hard work and grace. Looking forward to further pieces about her. Thanks, Rudri. We spend so much time on the material for my book 😉 that I haven’t really talked to you much about my MIL! You are such a sweetheart, Faith. Hubby probably looks at it more like how he’s always helping financially support the artists in his life ;). His artist mom, his writer wife, and now his actor/singer daughter. My MIL was definitely a treasure. And can you imagine how much fun it was to work at Birdland?! She really loved it. I loved reading this one. Can’t wait for more on MIL. Thanks so much, Doug. She was a great woman! This is fascinating and quite wonderful about Diana Dale, your husband’s mother. I am so excited to know this about his mother, your dear mother in law. I bet it was fun to listen to her stories about the Birdland, the musicians and even, New York City during this period of fantastic musical performers. I love the style of her colorful paintings but also, appreciate the black and white style, too. What an incredible achievement that she was chosen to do this art upon the walls of such a landmark. I will be here to check the continuing story, but apologize for my gaps in visits, ahead of time. I am always one of the last to respond but try to give much thought to your posts, Luanne. I appreciated your sharing your fantastic mother in law! Very, very cool. I grew up with the Broadway cast album of Kiss Me, Kate — my family wasn’t especially musical, but my mother loved show tunes. Lots of resonance there. Working at Birdland, with all those other amazing people . . . wow wow wow. Thanks, Susanna. Yes, I grew up with my mother’s cast albums, too. For a long time I didn’t realize the difference between the ones that were Broadway cast and those that were film soundtracks. She had a mix of both. But how I loved those albums. They were more a part of my childhood than pop music. My dad also had Dinah Washington, Nancy Wilson, other jazz singers, and he played those in the evening. I loved those, too, but I couldn’t understand them the way I thought I understood the show tunes. Patti, I’m so sorry your mother-in-law died too young. But what a warm feeling to know that you were close to her. I’m glad you enjoyed reading about my MIL! That is the coolest thing, her murals being on the Birdland walls. And, to me to close that gap between “the artist” and “the mother.” A fictional divide but one we often insist on. She must have been wonderful. I know, so cool! Did I ever tell you I wrote a paper once about “The Mother Poet”? Very informal rambling piece exploring that territory of being both. Thank you re my MIL–she was very wonderful!!! I didn’t know about your “The Mother Poet,” but I bet it was wonderful.